Due to increasing global demand for high-performance polymers, Germany’s Evonik says it is expanding its production of transparent polyamides of the Trogamid CX brand at the Marl Chemical Park (Germany). The company will be expanding its production in part through targeted debottlenecking efforts, in part through comprehensive optimization initiatives undertaken by production management. The plans for the project are complete and implementation has already begun. It says that demand is especially in the consumer goods segment, for specialized material solutions “that combine highest transparency, quality, and design freedom with the best processing characteristics”. It has been used in the sports, leisure, automotive, and cosmetics industries, as well as in medical technology and in optical applications. As a lens material for sports and ski goggles, the polymer offers crystal-clear visibility, high UV protection and excellent mechanical strength along with resistance to chemical substances such as those contained in skin creams or hair spray. In the automotive area, Trogamid is well known as a decorative material for interior applications that stands out for its high transparency and scratch-resistance. Evonik has just recently developed a new polyamide moulding compound for optical applications. Trogamid myCX high flow offers crystal-clear transparency, excellent wear comfort and high durability along with improved processing capabilities. This unique property profile makes the high-performance polymer a preferred material for high-end lenses and visors, e.g. in sun visors or ski goggles. In other news, chemical maker Borealis and its subsidiary Borouge have announced that the new compounding plant of Borealis in Taylorsville, North Carolina, has come on stream during Q1 2019 as planned, with the inauguration of the facility scheduled in May 2019. With dedicated production lines for thermoplastic olefin (TPO) and short glass fibre (SGF) reinforced compounds, the plant is ideally located in the southeast of the US to meet the growing needs of original equipment manufacturers (OEM) and Tier 1 customers in the region for advanced polypropylene (PP) solutions, while adding another 30 kilotonnes to Borealis and Borouge’s global PP compounding capacity. The 50,000 sq ft facility, with rail siding in place, offers further expansion possibilities to meet the growing demand of customers. The new plant is said to be an important addition to the global network of Borealis and Borouge’s established compounding plants in Europe, China and Brazil. 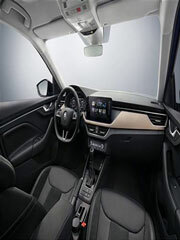 Among the first products manufactured at the plant, are automotive interior and exterior materials approved and listed by major automotive customers, including Daimler and Volkswagen Group. “We have successfully been using existing Daplen products in similar components before, but the new EE058AI grade offers unprecedented weight savings of up to 6.5% without compromising performance, which helps us lower our carbon footprint to meet committed fleet emission levels,” adds Luděk Bělka, Coordinator Development Dashboard for ŠKODA. Borealis Daplen and Fibremod long glass fibre thermoplastic materials are also used in further SCALA parts, from the interior door panels and dashboard carrier to the front-end module. The lower dashboard, glove box and centre console of the new ŠKODA SCALA are moulded in Daplen EE058AI, a low density 10% talcum filled and elastomer modified polypropylene compound from Borealis, enabling weight savings of 6.5% over the previous 20% talc solution.